“I think a lot of us are stuck,” one Auburn resident said. FORT GREENE — Approximately 80 percent of the vouchers the city has certified for homeless New Yorkers under the LINC rent subsidy program aren't being used, according to the Department of Homeless Services. Since the program began last year, 15,921 families and individuals living in homeless shelters were deemed eligible for LINC vouchers to help them pay rent in private apartments. But only 3,220 vouchers have actually been used to exit a shelter — about 20 percent of the number certified for the program. Mayor Bill de Blasio's administration started the Living in Communities, or LINC, voucher program in September 2014 to move families out of shelters and into stable housing, according to the Department of Homeless Services' website. There are six types of LINC vouchers, including one for families with adults working full-time and another for seniors and the disabled. The vouchers provide short-term rental assistance for those leaving a shelter, up to $1,515 for a family of three, with a maximum subsidy of $2,530 for a family of 10. The wide gap comes as The Legal Aid Society filed suit against an East New York housing complex it says refused to accept the vouchers. 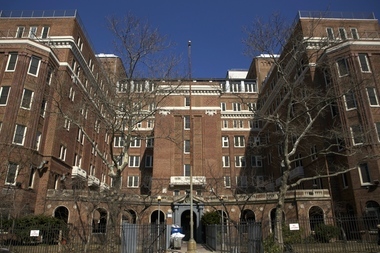 At the Auburn Residence in Fort Greene, shelter residents said they desperately want to move into their own apartments, but can’t find landlords willing to accept the vouchers. “People don’t want to deal with a LINC V voucher because they feel that it’s unreliable,” said one resident, who preferred her name not be used. She said she has tried between 20 and 30 landlords, to no avail. City shelters house more than 57,000 people, a number that spiked after subsidy programs similar to LINC were cut under the Bloomberg administration, advocates say. DHS officials said they were making efforts to educate landlords about the program, even offering a $1,000 “signing bonus” to any who accept LINC voucher-holders. “DHS works diligently to increase awareness of the LINC rental assistance programs among landlords and brokers," the department said in a statement, adding that it held meetings to raise awareness of the "bonuses and protections" for landlords and brokers. However, DHS officials said the Auburn Residence hasn't reported any issues with LINC vouchers, and added that "poor credit or eviction records have previously caused landlords to reject applicants" from Auburn. Another resident who has been living at the Auburn shelter for more than a year with two special needs children said she was granted a LINC IV voucher, she said, but hasn't found a landlord willing to accept it. She said caseworkers were unable to help. EDITOR'S NOTE: On Monday, a spokeswoman for the mayor's office provided the following statistics: of the 15,291 households deemed eligible for LINC, 7,482 households have obtained the LINC voucher and are currently in shelters looking for housing, while 5,231 households exited the shelter system through other programs.